The other day I was looking for something to help me get back to some real basics with being creative. Still being in a serious block I needed some ideas and prompts to jump start me. I like the idea of combining art, doodles and quick sketches with words and writing. I've been keeping journals like this for years but didn't even realize that's what they were. I thought they were just notebooks I filled with notes, reminders and memos to help me remember day to day stuff. But when I look back at them I realize they're more than that and they already have my "perfect" combination of sketches and words and lots of doodles. But I still needed assurance I was doing it "right". Turns out there isn't a right or wrong there just is. It is what it is. It is what you make it. It is what you want it to be. It is what feels right when you create it and it feels right here and now. It's for my eyes only so I'm not doing it for brownie points, or marks, or kudos or to impress anyone. Knowing this frees me to allow myself to do more whenever and where ever and however. Most of my journals are done in ball point pen or pencil which is good because I can always find a pen or pencil. I don't have to prepare anything I just do it. However, during my search for info I found the book Raw Art Journalling which led me to this blog. Both are packed full of ideas that are easy to follow and easily done. Quinn McDonald is seriously accessible (I sent her a note and she wrote back within a few hours. How cool is that?! ), empathetic and highly creative. 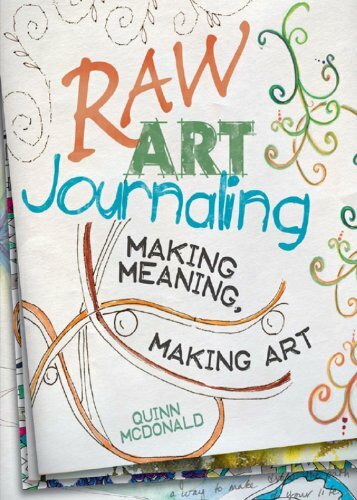 I highly recommend this book and I've already started my own Raw Art Journal.